Put time on your side with the famous TimeCube®! Today's life is busy and full of distractions. The TimeCube® was created to help you stay focused on the task at hand. Whether it be for self-improvement, wellness, cooking, family, or workplace productivity, this simple-to-use timer helps you manage your day. With the TimeCube®, there’s no more fumbling around with dials and buttons or getting distracted when setting the timer on your phone. Just flip the cube to the countdown time you need and get going. The cube will beep when the countdown is complete - just flip back upright to stop. It’s that simple. It's popular and a proven seller! 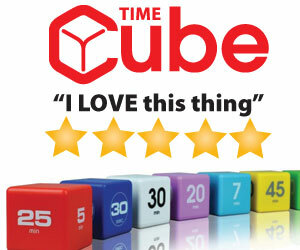 The TimeCube® is much loved and has a proven track record. It is the perfect tool to help everyone manage time in all sorts of environments, from teachers, parents, students, children, executives, and life coaches... in the classroom, at home, in the kitchen, at the gym, at the office... the possibilities are endless! Since the demographic touches so many lifestyles, you won't have a problem matching the TimeCube® with your customers or readers. Its rated 4.2 stars on Amazon with over 1,000 reviews, with an extensive fan base who frequently order multiple pieces, multiple times! Join our successful winning team! Become a Datexx TimeCube® Affiliate and become a smart tool advocate! Tell people about our awesome TimeCube®, and earn a 10% commission when they buy! Once you get approved, start spreading the love. Every time someone makes a purchase using your referral link, you earn 10% on their order. Payments are made only once an affiliate has accumulated a minimum of $20 worth of commissions.